Island Vibe Backpackers Hostel offers guests a wide choice of accommodation and prices. Our house on top of the dune (Main building) holds all the dorm accommodation, ranging from 4 – 12 sleepers. All accommodation includes duvets and pillows to make your stay with us a comfortable one. This is also where backpackers can grab something to eat from our restaurant or make something in the communal kitchen. The Island Vibe bar, TV room & communal ablution area form the centre of the main building. Campers have both the view of the ocean as well as being ideally located in the garden close to all the amenities. No bedding or camping gear is provided. This is a firm favorite amongst backpackers who love the great outdoors and sleeping under the stars. Come pick your spot on our big lawn. Our awesome garden cabins which have a double bed and are not en suite offers a cheaper option for anyone wanting privacy and is on a budget. Each one offers excellent views of the ocean, and has their own little balcony overlooking Jeffreys Bay Main Beach. We also have an en suite twin room at Island Vibes main building for those who need a bit of comfort to go with their privacy. Hostel accommodation that’s a class above the rest is also found here - at the foot of the dune, with a glorious panorama of the beach, sea and surf. Each en suite room of the beach house opens onto a balcony allowing the sight, sound and smell of the waves to be your first encounter of the day. The accommodation is all versatile in that they have a double bed and bunk bed, giving the option of twin, double, triple or 4 sleeper configurations. The crème de la crème of hostel accommodation is found right here too – Island Vibe offer the latest “craze” in backpacking…….Flashpacking! Same vibe as the traditional backpackers hostel, but with all the extras - Large comfy beds, white linen, towels and lots more. This is the place to settle down and really treat yourself while having fun & meeting other likeminded travellers. Flashpacking is the way to go if you feel like you deserve that little bit more. Where to from Jeffreys Bay? 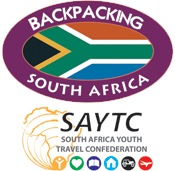 We offer accommodation in Port Elizabeth as well as in Knysna, two top destinations in South Africa. In Port Elizabeth you can either stay at Lungile Backpackers Hostel where you are walking distance from all the best pubs, clubs & restaurants as well as the Blue Flag beach. You can also strole down to the Boardwalk & Casino. 99 Miles Beach lodge “Flashpackers” is your other option. Very relaxed atmosphere combined with top quality amenities, in a leafy suburb of Port Elizabeth. The Flashpackers is only 15 minutes walk from the beach where you can get your feet wet or just kick back and read a book on the beach.